Certainly, he’s the most successful French playwright to hit English shores since Reza, whose 1990s hits – Life x 3, The Unexpected Man and, of course, the long-running (eight years in the West End), starry cast-rotating Art – were followed more recently by 2006’s God of Carnage in the West End, on Broadway and on screen. There are other commonalities beyond being French and scoring triple hits: both Reza and Zeller have a bagful of Moliere prizes (France’s Olivier equivalent) and both have relied heavily on translator Christopher Hampton to make their French sophistication suitable for English palates. There are also key differences. While Zeller describes both The Father and The Mother as farces, there’s no Reza like humour – it’s more the Chekhovian definition of ‘comedy’ – and he works hard to unsettle audiences with disjointed timelines, repetitions and alternative narratives. FYI, in France, The Mother (La Mere) and The Father (La Pere) were first seen in 2010 and 2012, with The Truth (La Verite) sandwiched between them in 2011. Below is an overview of their English-language versions and where you can see them. Also scroll down for tweets from my recent viewing of The Mother, click here for my blog after first seeing The Father last year, and be sure to follow me on Twitter @TerriPaddock for my first reactions when The Truth opens next month. 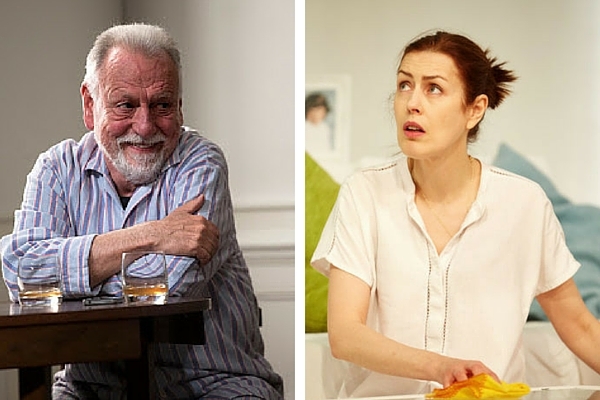 Kenneth Cranham won the Critics’ Circle Award for Best Actor for his performance as 80-year-old Andre, in the grips of dementia, which had its UK premiere at Theatre Royal Bath in 2014 then toured and transferred to the Tricycle and on to the West End in 2015. It returns to the West End, for five weeks at the Duke of York’s from 24 February to 26 March, prior to another national tour. For the new dates, Cranham is joined in the cast by Amanda Drew, Rebecca Charles, Brian Doherty, Daniel Flynn and Jade Williams. James Macdonald directs. Gina McKee takes the title role here. She plays middle-aged Anne, who is struggling to cope with life now that her two children are both grown and flown the coop. She broods and pop pills, suspecting her high-powered husband (Richard Clothier) of infidelity and longing for the return of her idolised son (William Postlethwaite). The Mother also had its UK premiere, last year, at the Theatre Royal Bath and has transferred to London’s Tricycle Theatre, where it has added extra (already sold out) dates and is now running until 12 March 2016. Laurence Boswell directs. In The Truth, Zeller switches his focus from the nuclear family to two couples. The brief description in the press release promises “friendship, suspicion, deceit… and the truth”. The four-hander stars Tanya Franks, Alexander Hanson, Frances O’Connor and Robert Portal, directed by Lindsay Posner. While Theatre Royal Bath is also associated with this third UK offering of Zeller’s work, The Truth premieres at London’s Menier Chocolate Factory, where it runs 10 March to 7 May 2016.